As a long-time vegetarian, I must admit I struggle with adding enough protein to my diet. Over the last several months, I've been making strides toward getting my act together. When I eat more protein, I undeniably feel fuller for longer and have a distinct sense of mental clarity that usually gets lost in all my shameless carb-consumption. Good or bad or, perhaps, lazy, what I make for breakfast sets the tone for how my day of eating might go. So, I've been focusing on protein-rich foods -- or, rather, I had planned to. But how much should we really start the day with? Apparently I wasn't getting nearly enough! Exerts seem to agree that runners need "1.0 to 1.6 grams per kilogram a day (or .45 to .72 grams per pound)" each day. So, for me, a 130 pound woman, this means roughly 75 grams daily if I want to hit that goal dead center. Divided by three meals (and maybe a snack or two), I should be shooting for around 20-25 grams at breakfast. // 1. An EGG contains roughly 6 grams of protein, so if you eat two of them for breakfast, you're already getting in a good chunk of your daily goal! // 2. 6 ounces of nonfat GREEK YOGURT is just 100 calories, but boasts 18 grams of protein in a neat little container. I avoid flavored varieties, though, which contain an alarming amount of sugar and cost more than a big tub of plain! // 3. A serving of packaged TOFU comes in at 8 grams of protein, though I often eat a double serving -- 16 grams, yahoo! // 4. 2 tablespoons of NUT BUTTER contains as much as 8 grams of protein. But be sure to choose varieties with low sugar, no hydrogenated oils or consider making your own. // 5. A cup of low-fat COTTAGE CHEESE packs an impressive 28 grams of protein, and it's quickly becoming my new favorite snack. // 6. A half cup of BLACK BEANS will give you 8 grams of protein. Kidney beans, 9 grams. Garbanzos, 7 grams. White beans, 8 grams. // 7. A cup of SOY MILK provides 8 grams of protein. Skim milk also comes in at 8 grams. // 8. Each cup of QUINOA has 8 grams of protein. A great substitution for rolled oats, which have an impressive 5 grams per 1/2 dry cup, on more savory days. Having a handy guide for which foods to choose is only half the battle. Stay tuned! In my next post on this topic, I'll be offering up 15 recipe-lite breakfasts incorporating these foods (and others) to total my protein requirement. 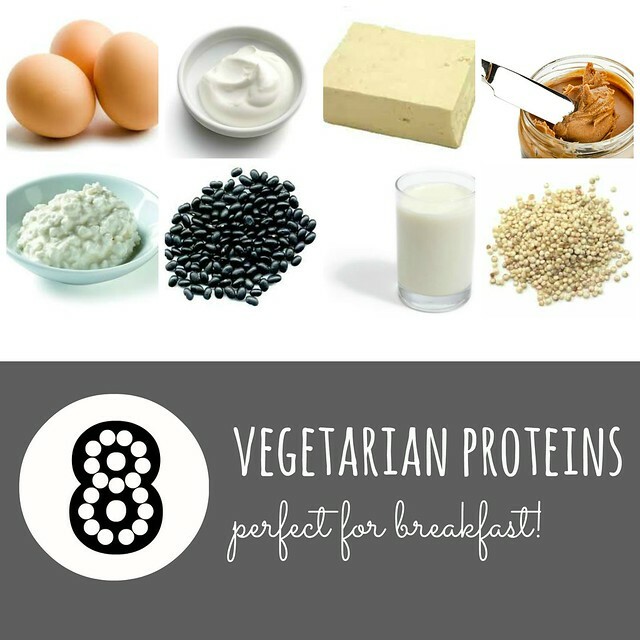 Do you care much about protein for breakfast? What foods do you like?